Summary: Kazuhito Harumi is a seemingly normal college student that is obsessed with reading. I mean, he LOVES reading. You put any type of print in a room and you had better believe that he’s reading it. He has a favorite book store where everybody knows his name. He’s up to date on all the latest issues and volumes in book series. Unfortunately, he is killed in the middle of a robbery and comes back to life as a dachshund. 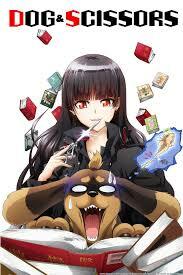 Kazuhito then ends up with this mysterious woman that can understand his thoughts even though he is a dog. She uses scissors on Kazuhito to abuse him, hence the name, Dog & Scissors. This was a funny show, and a quick watch, with only 12 episodes. The way they incorporate the writing aspect into an anime style makes for a really good time. You might enjoy this if: You are interested in a comedy that uses reading and writing as its main focus. The laughs are not off the wall, but the humor is definitely there. It is, in general, a light-hearted comedy. You might not like it if: You are on the prowl for a drama or action-packed anime. 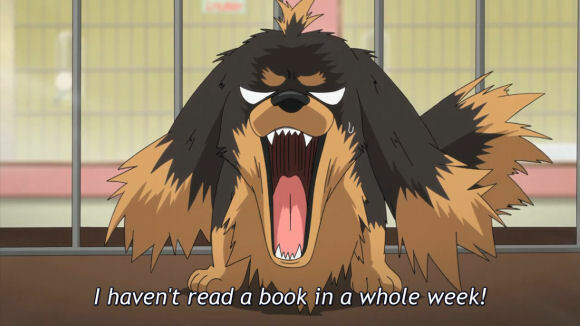 Note to the Viewer: It’s different because the main character is a dog that can only communicate with one person. This entry was posted in Anime and tagged 2013, 4, anime, comedy, dog, fragglepuss, hasami, inu, reading, review, scissors, summer, to, tsukaiyou, wa. Bookmark the permalink.